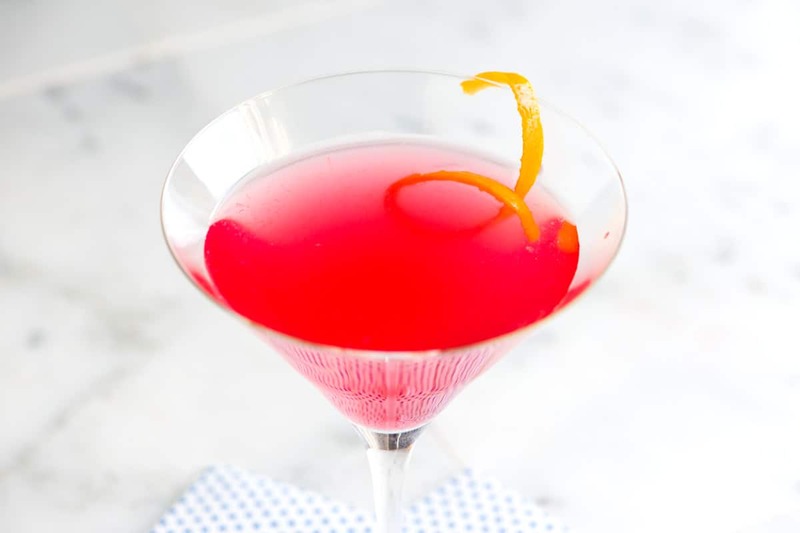 Not overly sweet or too tart, our cosmopolitan cocktail recipe is perfect to shake up for one or even prepare in advance for a crowd. Jump to the Cosmopolitan Cocktail Recipe or watch our quick recipe video showing you how we make it. While there are many variations, ours comes from what we (and most of our friends) keep stocked in our pantry. Good vodka, triple sec (we like to use Cointreau) and fresh lime. A twist of sweet fragrant orange peel and you’re set. When choosing the vodka, go for something mid to high range. We’ll usually stock Stolichnaya or “Stoli,” but use what you know you enjoy. The other thing to remember, here is to use fresh lime juice – not the bottled stuff. We realize it’s a little more work, but the taste is so much better. YOU MAY ALSO LIKE: How to make one of our favorite cocktails — The Old Fashioned. 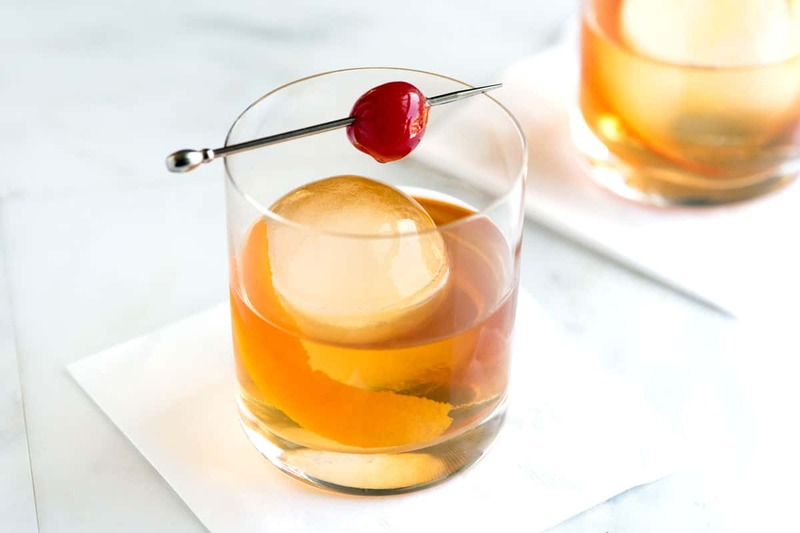 See our recipe and tips for making the best Old Fashioned at home. Lastly, we love adding a little orange peel to this. Sure, it may look like an unnecessary garnish, but if you do it right, it’s adds a little sweetness and as you go into to take a sip of the cosmopolitan cocktail, you’ll get orange essence, which hides the strength and scent of the vodka. When you add the orange peel, peel it over the drink. This way, any oils that spray out from the orange, fall into the drink. Rubbing the edges of the glass doesn’t hurt either. It’s such a fresh, bright and happy drink. Don’t you think? 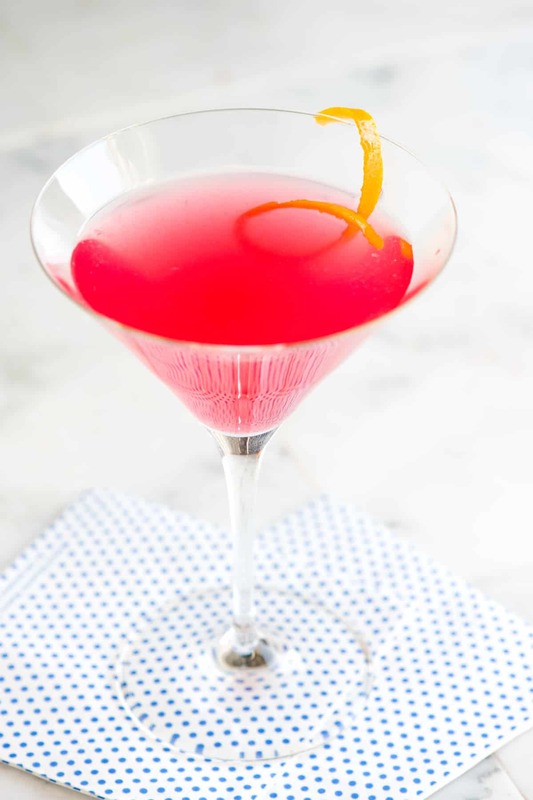 Not too sweet or too tart, this cosmopolitan cocktail recipe is perfect to serve one or many. We like to use unflavored or citrus flavored vodka in this. If you can, since there is quite a lot of vodka in the recipe, choose vodka that is medium priced or that’s even top-shelf. We like to use Stolichnaya. We love adding a little orange peel to this. 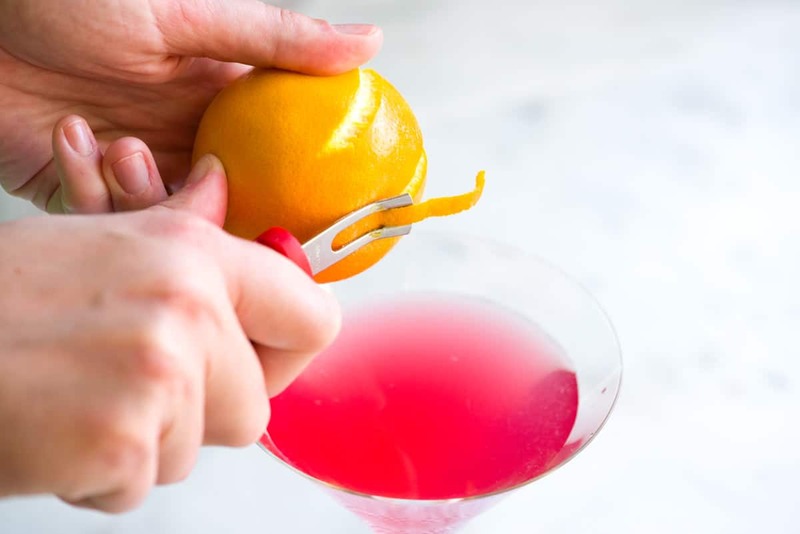 Sure, it may look like an unnecessary garnish, but if you do it right, it’s adds a little sweetness and as you go into to take a sip of the cosmopolitan cocktail, you’ll get orange essence, which hides the strength and scent of the vodka. When you add the orange peel, peel it over the drink. This way, any oils that spray out from the orange, fall into the drink. Rubbing the edges of the glass doesn’t hurt either. Fill a cocktail shaker with ice then add vodka, triple sec, cranberry juice and lime juice. (We like the extra bite of extra lime juice, so we use 1/2 an ounce in our cosmopolitan cocktails. However, use what is best for your taste). Shake the cocktail shaker for about 30 seconds until well chilled. Then, strain into a martini glass. Garnish with orange peel/twist. For an extra burst of flavor, peel the orange twist over the filled cocktail glass. This way, the orange oils spray into the glass. Cranberry juice: You can use sweetened cranberry juice (often called “cranberry juice cocktail”) or unsweetened plain cranberry juice. If you use unsweetened, you will likely find that you need to add a small splash of simple syrup or agave since it can be quite tart. To make 4 drinks at one time, add 1 cup vodka, 1/4 cup triple sec, 1/3 cup cranberry juice, and 2 to 4 tablespoons of fresh lime juice to a pitcher. Stir and adjust to taste. Refrigerate. When ready to serve, pour into four martini glasses and garnish with orange peel/twist. This was great! Very balanced. Two oz of vodka is perfect in my opinion. You’re right – it must be fresh squeezed lime. The bottled stuff ruins it. I love Cosmos and this is my go-to recipe and has been for a number of years. I use GranGala (a less expensive version of Gran Marnier) and during the holidays when I have my homemade Spiced Apple Cranberry relish on hand, I add a very little dollop of that to my shaker. Absolutely perfect! Not too sweet, not too tart, wonderful! Excellent balance for a Cosmo!! This is my go to now for making them. Really really good!!! Not too sweet and not too sour. I didn’t think at all it was too strong either! Nice! You are using Cranberry juice and not Cranberry juice cocktail right? For our recipe we use cranberry juice cocktail. If you use unsweetened, you will likely find that you need to add a small splash of simple syrup or agave since it can be quite tart. My (wife’s) tastes tend to gravitate to more sweet and less alcohol. I add 1/4 oz simple syrup (equal parts sugar and water ) and beef up cranberry juice a bit. 1.5 oz vodka, 1/2 oz Triple Sec, 1 oz cranberry juice, 1/2 oz lime juice, 1/4 oz simple syrup. Add some fresh micro-grated ginger. This is my go to recipe for Cosmos. When I ask who wants what cocktail, I always get the most requests for Cosmos. I’m pretty sure what takes it over the top for most of these folks is the orange oil that sprays into the glass when you peel it over the top. I used to use Ketel One, but have found that a cheaper vodka is almost as good (Wheatly is good for a crowd). Also, when I’m out of limes, I have substituted sweet and sour mix with good results. 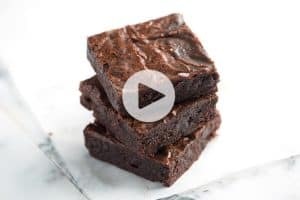 Thanks for introducing me to your recipe. This is not a great Cosmo… The Vodka is way too much… Didn’t enjoy it at all. Will use another recipe rather. Hi Wayne, So sorry you didn’t enjoy the recipe. Next time, you could reduce the vodka — maybe start with 1 ounce and go from there. Delicious Cosmopolitan. I used a bit more “real” cranberry juice cocktail than the recipe, and the twist of orange at the end, I squeezed the peel first. It made it special and smelled great. I almost left out the orange peel, but then decided what the heck and was very glad I added it! I made this Cosmo but found I didn’t like how the lime juice tasted in it, so now I omit that. I didn’t have any triple sec so I used Gran Marnier. My cranberry juice was 100% juice and I did not find it necessary to add sugar or simple syrup. It was delicious – I had three! This was a little too strong as written. I changed it up as follows, and my wife loves it now. 1.5 ounces Orange Vodka, 1 ounce Triple Sec, 2 ounces Cranberry Juice (100% juice, not cocktail and not pure cranberry juice, which is bitter), 1 tsp. fresh lime juice, or to taste (too much ruins the drink) – I cut a lime in half and use one half for two drinks. That’s it! This is my wife’s favorite drink now! The type of Cranberry juice really matters. BUY JUICE COCKTAIL, for the added sugar. Or sub in a touch of agave syrup as others suggest. I tried my first Cosmo just the other night when I was having dinner out. Loved it!! So I bought all the supplies and used your recipe last night and it was delish!! Thank you!! 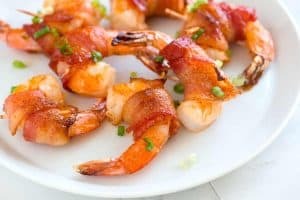 Delicious using Rose’s Sweetened Lime Juice (found in grocery stores) too. Also added green food coloring for a pretty kelly green drink for St. Patrick’s Day party. Great drink to make for any party. I added 3/4 oz Pom juice too. I enjoy cranberry & pomengrate together. Perfect every time. Made this cocktail a lot over xmas! Big hit with guests! Wouldn’t alter anything. Thank you so much for recipe!! Thank you for a delightful cosmo recipe. I love them but it is hard to find a place that truly knows how to craft one. So, thanks to you, I can stay home and enjoy one. Side note…. bc I juice fresh cranberries, that is what I used plus equal part simple syrup then used correct measurement from that for recipe. Wow this Cosmo is soooooo good. Had to sub Cointreau for Triple Sec and it is fantastic. Cointreau is a brand of Triple Sec. It is the industry standard for good Triple Sec. It’s like saying I had to Substitute Stolichnaya for Vodka. Delicious! Thank you for the Cosmopolitan recipe! I give it 5 stars! It’s xmas eve and I needed something to start it off with!